We are honored that Khen Rinpoche Geshe Lobzang Tsetan will visit and share his wisdom on How to Be Happy (in English). This is his first visit to Ocean of Compassion, so please join us in this special opportunity to warmly welcome him. Lunch will be provided afterwards. ​Since his appointment by His Holiness the XIV Dalai Lama in 2005, Khen Rinpoche Geshe Kachen Lobzang Tsetan has been the Abbot of Tashi Lhunpo Monastery-in-exile, the traditional seat of the Panchen Lama. Khen Rinpoche began his monastic life at age 7, in his native village of Stok, Ladakh. When he was 15 years old he walked with his father from his home in Ladakh to Shigatse, Tibet to study at the famous Tashi Lhunpo Monastery. They walked the 800 mile trek over the Himalayas for over two months, most of it barefooted. 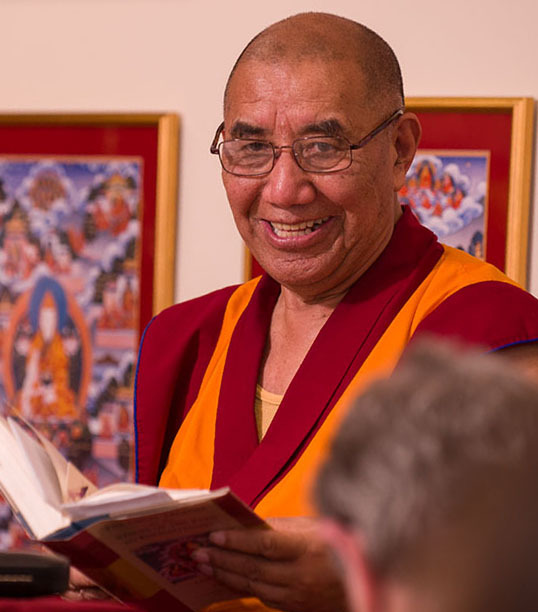 In the late 1970’s Khen Rinpoche was invited to the United States where he learned English and taught classes at the Tibetan Buddhist Learning Center in New Jersey. He returned to Stok in 1995 and founded the Siddhartha School. It was his wish to give children in this remote Himalayan area a well-rounded education and the skills that will allow them to represent themselves and their culture in an evolving global community. ​Since accepting the position as Abbot of Tashi Lhunpo Monastery-in-exile in 2005, Khen Rinpoche has dedicated himself to overseeing and rebuilding this important monastery. Because the lineage of Tashi Lhunpo goes back many centuries in Tibet, it is important to reaffirm and re-establish this symbolic monastery’s place in its new home in Bylakuppe, Southern India, as well as to strengthen its predominance and influence in the Tibetan Buddhist community and in the world at large.